Scientists already know that music can affect a person's physiological state, inducing excitement or relaxation. 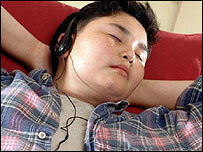 But researchers have turned the idea on its head with a system that composes music based on how relaxed a person is. 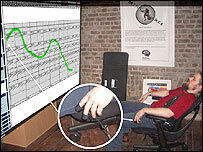 The application, under development at MIT's Media Lab Europe, uses biometrics to control what the listener hears. As the listener relaxes more, different instruments start to play. The system could be employed as a useful stress-management application in the future. "The project is based around the idea of drifting deeper into music according to a positive biometric state, said Phil McDarby, research associate with the Mind Games groups at the Dublin labs. "The piece consists of seven distinct layers, including bass, piano, strings and flutes," he told BBC News Online. "As the user relaxes the layers are peeled back and they drift deeper into the music." Slipping on two biometrics onto the fingertips is the easy part. They detect specific changes in conductivity that happen - a Galvanic Skin Response (GSR) - dependent upon a person's state. The difficult part is concentrating on relaxing in order to "unlock" the seven different layers of the music, and some who have tried the system have only heard a bass line, indicating their stress management is ineffective. "I guess the central idea is to extend music through biometrics, to try and give it a different dimension, a dimension contingent on how the user is 'feeling'," said Mr McDarby. "I've always composed and I just thought wouldn't it be cool if you had a piece of music, a really full piece of music, that you only heard a little of if you weren't in the correct biometric state. "By chilling out and relaxing, you drift in and out of the music." Called Peace Composed, the project grew from previous work the Mind Games research group had developed which used bio-feedback technology in a game. Relax to Win was developed to help children with problems like anxiety, phobia, and post-traumatic stress, and has now been installed at Mater Misericordiae Hospital. Only a handful of people have tried Peace Composed, however, and the project is only just over a month old. Its inaugural public outing was at the Media Labs' open day in Dublin at the end of last month. But it already works surprisingly well. The listener is mostly unaware of what effect he or she is having, until the realisation dawns that a cacophony of instruments is weaving their way from finger and electrode to ear and head. Mr McDarby hopes to extend the system to allow a more collaborative and fun approach to stress management. But it could also be used as an innovative form of music production. "Imagine a number of people each had wireless GSR sensors and each controlled a 'part' of the song. "Or an entire orchestra, who instead of their instruments, had a GSR sensor on which would reveal their pre-recorded segment according to their physiological state," he said. The researchers have now moved on to the next stage of the project which is to develop the interface to the system.